This is a super simple skillet meal that comes together in no time. Spring is almost here, which means the weather will be warmer and we will be spending a lot more time outside doing yard work. So, super simple meals are always nice to have planned for dinner, when you might be short on time. I usually have most of these ingredients on hand, so that makes me love it even more. I threw this together one night and it was so easy and the flavor was great. I really like the addition of the crunchy peanuts and they add great texture. 1 Tbl. brown sugar, opt. Combine chicken broth, soy sauce, peanut butter, brown sugar, white wine vinegar, sesame oil, ginger and cayenne pepper in a small bowl and whisk until well combined. In a separate small bowl, stir together cornstarch and one Tablespoon of chicken broth or cold water until cornstarch is dissolved and then stir into the soy sauce mixture; set aside. Heat olive oil in a large skillet over medium heat. Add chicken tenders to hot skillet and cook until browned and then flip and cook until browned on the other side. Add the chopped green onions and minced garlic to the skillet with the chicken. Using a wooden spoon, break the chicken into pieces as it finishes cooking all the way through (or you can remove it from the pan when it's cooked through, chop it and add back to the skillet). 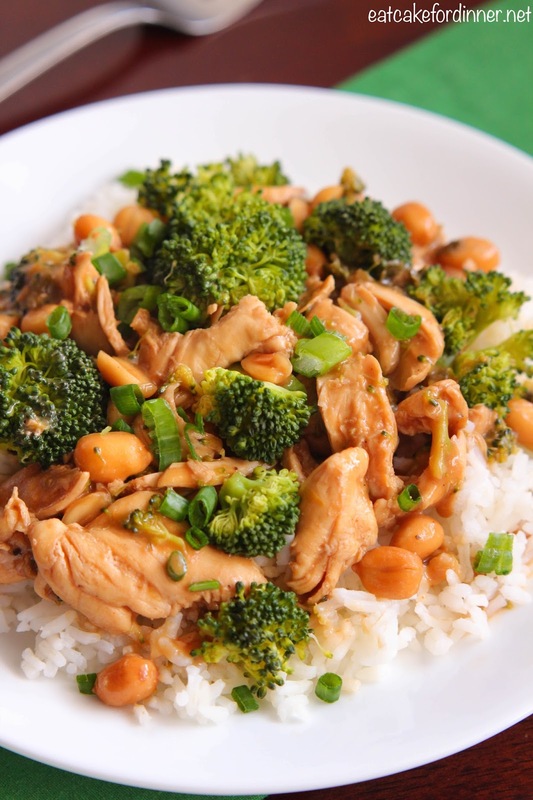 When chicken is cooked through, add the broccoli, peanuts and soy sauce mixture to the skillet. Cook until broccoli is tender and sauce is thickened, about 5 minutes. Serve over cooked rice. Serves 3-4. Jenn's Notes: When you cook the broccoli in the skillet, as listed in the instructions, it looses its bright green color. If you want your broccoli to stay bright green, try steaming it in the microwave and stirring it into the dish right before serving (this is what I like to do). I made this for dinner tonight, and it was delicious! My family loved it. A definite keeper. Thanks for posting great recipes! Yay!!! I am so glad you liked it. Thanks for letting me know. My husband LOVES Thai food, but I wonder if this is too hot for my kids. We also have a broccoli allergy in the family. Any suggestions on other veggies to use? This dish was not hot at all, but you could always skip the cayenne pepper, if you're worried about it. (I'm a spice wimp and don't like anything even the tiniest bit hot, but I didn't taste it at all.) Maybe try it with asparagus and green beans? I think it would be great with any veggies. Thank you guys!! I agree with what Jessica said about the veggies. I was also going to suggest asparagus or maybe carrots.